Welcome to the Sahara Desert! Event: +Tinariwen at the The Bunkhouse Saloon, Downtown Las Vegas, October 21st. 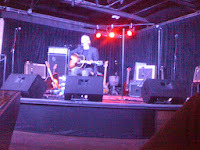 The opening act was singer-songwriter Howe Gelb, from Giant Sand, an American rock band, based in Tucson, Arizona. He played an intimate electric/acoustic set which fit well the mood of the evening. +Tinariwen was warmly welcomed into the stage and began by chanting their hypnotic desert blues songs, receiving multiple standing ovations by an enthusiastic crowd. 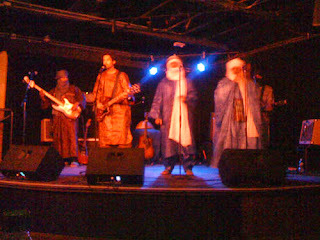 All of them dressed up in their colorful tuareg robes, they played for over an hour, and between songs greeted the audience with words like, "ça va? It's okay?" to the delight of all. Their music is very well crafted, deeply rooted in the Mali tradition, updated with groovy, funky bass lines and bluesy guitar patterns. 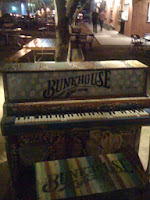 The Bunkhouse proved to be a great place for this laid back experience, a very well organized and safe place it seemed.